Happy Fall Y’all! 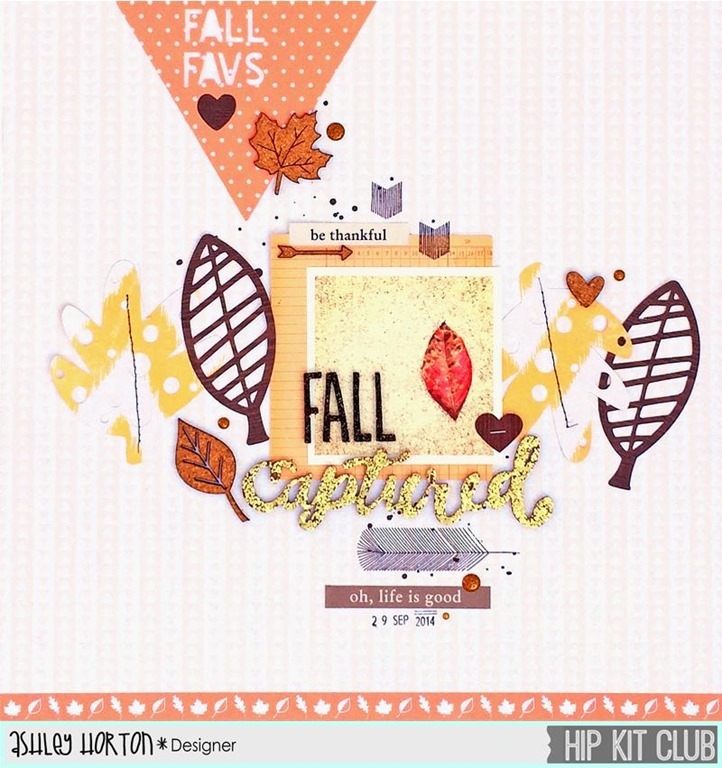 It’s time to start sharing layouts and projects, using our October 2014 Hip Kit & Add-On Kits! I had to start out with a Fall layout, since this is my favorite time of the year! I’ve been looking forward to using the cute Sycamore Lane collection from Elle’s Studio, that’s included in this month’s Kit! I mixed in a little bit of Teresa Collins and Crate Paper also. And a Fall layout definitely needs leaves, so I cut some leaf shapes on my Cameo and then mixed in some of the cork pieces from the Sycamore Lane collection. 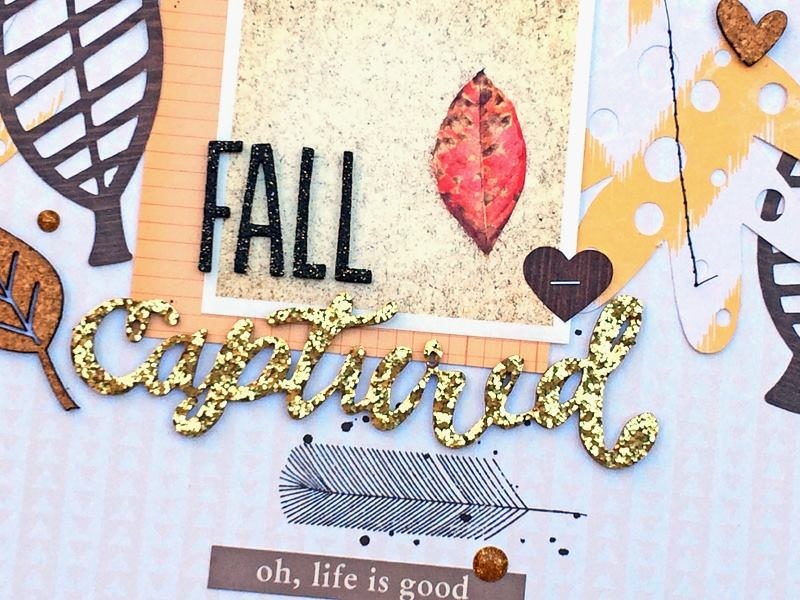 The Gold Thicker words in this month’s Kit are so fabulous, and I paired the word “captured” from the pack with the Black Journal Thickers, to layer my title over the photo. And then I finished my layout, by adding some stamping and a few of the Studio Calico Gold enamel dots! 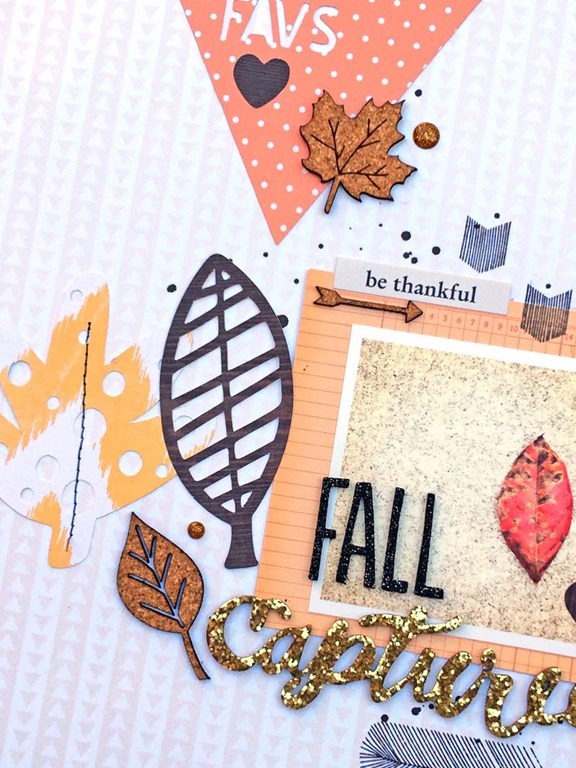 After I finished my Fall Captured layout, I had an epiphany for using one of the negative leaf shapes on a card. I used it as a mask, along with the Gelato included in our October 2014 Stamp Kit. I placed the negative cut leaf shape on a square piece of White cardstock, and drew around the edges with the Gelato. I removed the leaf mask, and used my finger to spread the Gelato to the center of the leaf shape. Then I stamped a sentiment from the Sycamore Lane stamp set, in the center of the leaf shape. I embellished my card with the Studio Calico enamel dots and stickers from Teresa Collins. Great layout! Love the leaves!